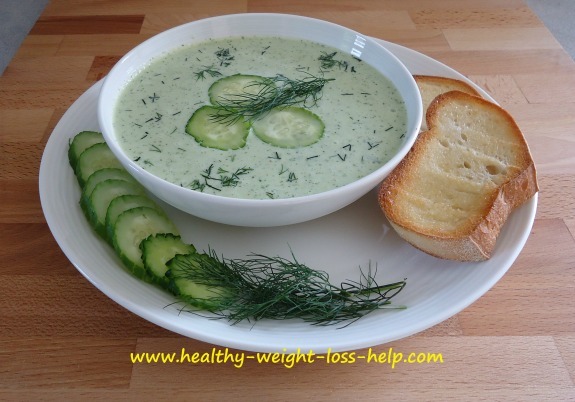 This Diet Cucumber Soup Recipe has 8 fabulous reasons for being so popular. This diet cucumber soup recipe has so many pluses. The first plus is that it's the beginning of August, which means, yes, it's still cucumber season. Look at the bountiful harvest (yes from our garden). The only trick is to keep coming up with different recipes to keep this vegetable exciting for a couple weeks longer. So now that we have indulged in every type of salad that is made with cucumbers and we are all super hydrated by drinking vast amounts of cucumber water, trying something different sound very appealing. In all honesty, I've never been a big fan of cold soups, but since most of these ingredients sound so delicious and we have 10 minutes to spare, what the heck, we'll give it a try. Add all the above listed ingredients into your food processor and blend until smooth. Refrigerate soup for 4 hours before serving so it's nice and cold. Makes about 2 - 3 servings. Garnish soup with some dill and a couple of super thin slices of cucumber (otherwise they will sink). 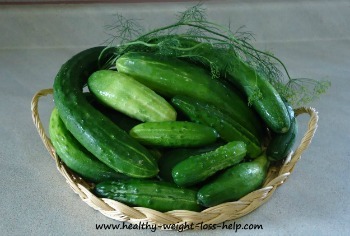 Once you have blended the ingredients together and if you find the soup too thin, now is the time to blend some more cucumbers into the mixture to thicken it up the way you like it, as it will not get noticeably thicker after being cooled. It's nice to serve this cucumber soup recipe with a little garlic toast or your favorite crackers. For those folks who are not a fan of dill, just omit it. The soup is still so worthwhile to try. This has now become one of my favorite diet soups. Low in calories, easy on the pocket book, nutritious, and oh yes, 10 minutes preparation time.